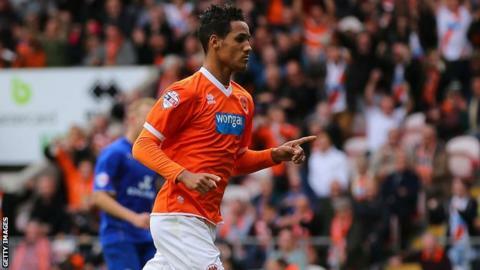 Blackpool have offered a new deal to Thomas Ince, although chairman Karl Oyston says the club are expecting more interest in the winger in January. Should Ince leave next month, Oyston does not believe he will move overseas. "We get compensation if he goes abroad, but I think it's more likely a domestic club will make an offer in January," Oyston told BBC Radio Lancashire. Ince is able to sign a pre-contract agreement with a non-English club in January, although Blackpool would be due compensation for the player as he is under the age of 24. Dutch giants Ajax are among the sides linked with a move for the England Under-21s international, who has scored six goals in 18 club outings this term. "Again, it's down to Tom and his father [Blackpool manager Paul Ince] whether we choose to sell or keep him until the end of his contract," continued Oyston, who stressed that he would like the former Liverpool trainee to remain at Bloomfield Road. "We have offered him a new contract. It's very fluid, there's nothing definite and I certainly shall not start speculating. Who knows what will happen, but it's an interesting situation." Ince was the last season and turned down a move to newly-promoted Cardiff in the summer for family reasons.